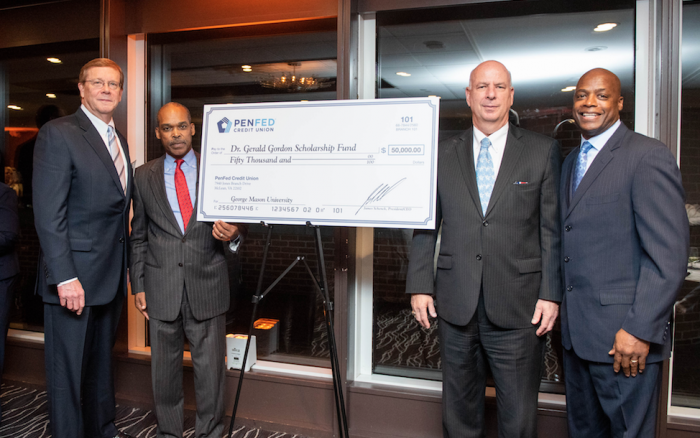 TYSONS, VA (December 6, 2018) — PenFed Credit Union last night made a challenge grant of $50,000 to start the Dr. Gerald Gordon Scholarship Fund at George Mason University. The donation was presented by Rocky Mitchell, PenFed Executive Vice President of Global Fixed Assets, during a celebration hosted by the Fairfax County Economic Development Authority (FCEDA) Commission in honor, of Dr. Gerald Gordon’s 35 years of service to Fairfax County, Virginia. The evening event honored Dr. Gordon who is retiring after serving as president and CEO of the FCEDA in Fairfax County. PenFed’s Mitchell is a member of the FCEDA Commission, the Authority’s governing body, and served with Dr. Gordon for the past three years. Dr. Gordon taught at George Mason University, Catholic University, the University of Maryland, and Virginia Commonwealth University. In the last decade Dr. Gordon has chaired the boards of the Fairfax Symphony, the Arts Council of Fairfax County, the Foundation for Fairfax County Public Schools and the George Mason University Honors College. He also has served on the board of the International Economic Development Council and is a Fellow Member and Honorary Life Member of the organization. The event was held at the Tower Club, Tysons Corner in Tysons, Virginia. Attendees included many from the Fairfax County business community and Fairfax County government. Established in 1935, Pentagon Federal Credit Union (PenFed) is America’s second-largest federal credit union, serving 1.8 million members worldwide with $25 billion in assets. Our mission is to help members reach their financial potential. PenFed Credit Union offers market-leading certificates, checking, credit cards, personal loans, mortgages, auto loans, student loans, and a wide range of other financial services with members’ interests always in mind. PenFed Credit Union is federally insured by the NCUA and is an Equal Housing Lender. To learn more about PenFed Credit Union, visit PenFed.org, like us on Facebook and follow us @PenFed on Twitter. Interested in working for PenFed? Check us out on LinkedIn. We are proud to be an Equal Employment Opportunity Employer. Time magazine called Fairfax County “one of the great economic success stories of our time.” The Fairfax County Economic Development Authority promotes Fairfax County as a business and technology center. The FCEDA offers site location and business development assistance, and connections with county and state government agencies, to help companies locate and expand in Fairfax County. In addition to its headquarters in Tysons Corner, Fairfax County’s largest business district, the FCEDA maintains marketing offices in six important global business centers: Bangalore, Berlin, London, Los Angeles, Seoul and Tel Aviv. Follow the FCEDA on Facebook, Twitter and LinkedIn.